Apart from the glitz and the action of internationally acclaimed surfing competitions, Oahu’s North Shore is also a fantastic spot for avid beach-going tourists and nature lovers. It’s a hotspot for Polynesian culture and is home to some of the world’s most beautiful beaches in the world. 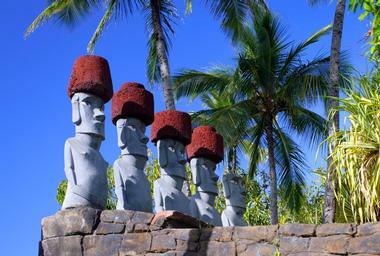 The Pacific Islands are oozing with culture and an incredible heritage that is hundreds of years old. If you’re keen on learning all about Polynesian culture, then a visit to the Polynesian Cultural Center should definitely be on your itinerary. Featuring 42 acres of lush tropical land, this cultural center features authentic Polynesian villages and natives from six Pacific cultures that are eager to share the majesty of their cultures to visitors through dance, music and other traditions. There are tons of things to do and shows to enjoy at the center including the “Ha: Breath of Life” Show, an authentic Polynesian luau, taking a trip to the Hukilau Marketplace, and the Circle Island Tour. Stretch your legs and explore a beautiful national historic landmark in the North Shore when you visit the Pu’u O Mahuka Heiau State Moment. As the largest Heiau in Oahu, the Pu’u O Mahuka Monument is nestled at the top of a beautiful mountain situated to the northeast of Waimea Bay Beach Park. 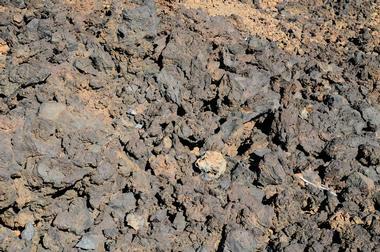 The Heiau is considered a sacred site, as it was once a major temple when it was still standing over 250 year ago. Dedicated as a luakani, the Pu’u O Mahuka Heiau State Monument was once a site of ceremonies and, as such, is not permited to be touched or disturbed in any way. What makes the visit fun and worth it, however, is the hike to the monument and the nature walk that surrounds it. Treat yourself to gorgeous views as you learn about this cultural and historical sacred site in Oahu. Go loco over pineapples at Hawaii’s most exciting and complete pineapple experience – the Dole Plantation. Unbelievably, the Dole Plantation finds its humble beginnings in 1950 when it first operated as a fruit stand. 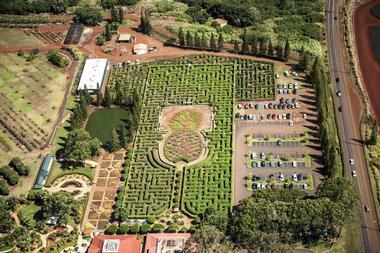 The plantation itself was opened in 1989 and has, since then, become one of Oahu’s top tourist attractions. Seeing over a million visitors each year, the Dole Plantation offer activities like the Plantation Garden Tour, the Pineapple Express Train Tour, and a mind boggling but enjoyable excursion at the Pineapple Garden Maze. For visitors curious about the plantation’s history, there are information displays and presentations available around the plantation. Don’t forget to stop by the plantation country store to grab exclusion Dole favorites and gifts. A small farm consisting of just 7 acres of land, the Green World Coffee Farms is home to over 3,000 arabica coffee trees on the pristine North Shore of Oahu, Hawaii. Owned and operated by Howard Green, Green World Coffee Farms was established in 2013 and quickly grew to be one of the best places in the state to get locally grown beans. 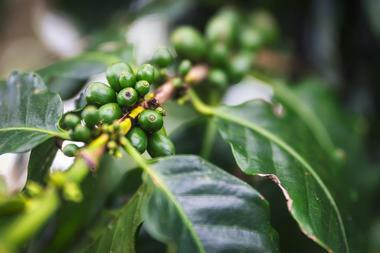 All of their coffee is roasted at the farm and in small batches to ensure the freshness of their roast. Stop by the espresso bar to enjoy a full menu of various coffees to sample, and make sure to visit the retail section as well to pick up bags of your favorite roast. Teas are also available to visitors for those who don’t quite enjoy a cup of joe as much as others. To make the most of the farm, be sure to take a self-guided tour of the coffee farm as well where you can see the journey of the coffee bean from seed to cup. Explore the best of Hawaii’s natural wonders at the Gunstock Ranch. 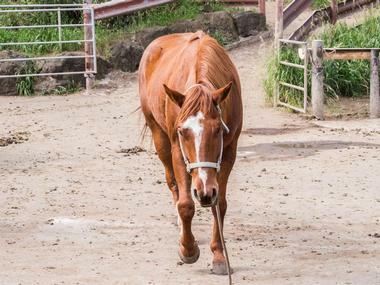 Discover hidden gems from the within the ranch and see the best of the Oahu’s backcountry on a private and guided UTV tour or on the back of a horse. 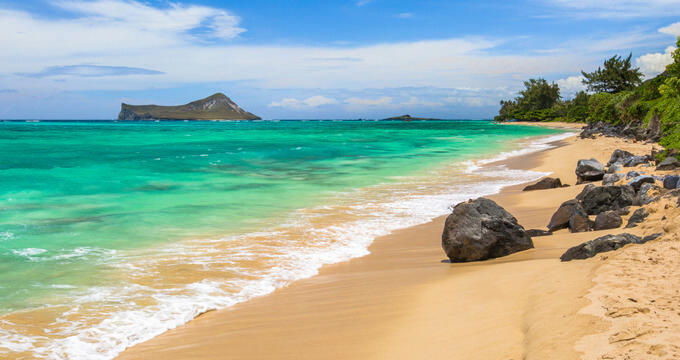 Tours visit exciting locations such as a hidden cave, historical WWII sites, ocean view points and even some of the shooting locations of the popular television show, Hawaii 5-0. Knowledgeable guides will excite visitors with stories and the history of the land while younger visitors can enjoy visits to the Hawaiian Legacy Forest, splash around in the ocean, or participate in special events that are both memorable and informative. See the North Shore the way the birds do, from the skies. 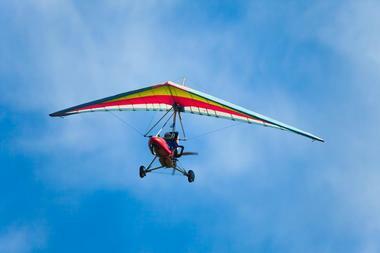 With Hang Gliding Hawaii, guests will get a bird’s eye view of the Oahu as they soar over the Ko’olau Mountain Range. Feel the ocean spray as you so glide over the white sandy beaches and beautifully glistening turquoise waters of Waimea Bay and Ka’ena Point. Tours with Hang Gliding Hawaii feature the use of the most state-of-the-art flying motorcycle in the Pacific, the Evolution Revo Trike. The flying motorcycle is capable of gliding and landing at anywhere without the need for an engine and ensures the safety of riders with a rocket-propelled emergency parachute. 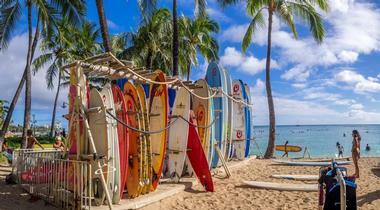 What could be better than enjoying the sun, surf and sand of Oahu’s North Shore? Well, if you’re an animal lover, throwing four-legged furry friends into the mix sounds like a pretty good way to make your day of surf that much better. At Hawaii Surf Dogs, ocean adventures are all mixed with the companionship of wave riding pups, and are available to visitors of all ages and skill levels to participate in. 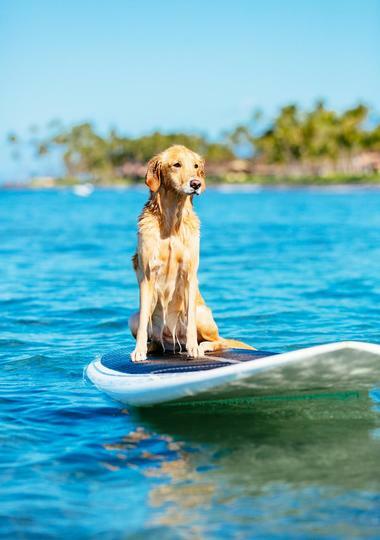 Guests will get to ride and surf waves in tandem with a surf dog while newbies will also ride with Rocky Canon, the lead guide of Hawaii Surf Dogs. Visitors who aren’t quite ready for the wild waves of Oahu can also head for calmer and flat waters for some SUP with a PUP, stand-up paddle boarding with a pup on board. Explore the beautiful beaches of Haleiwa and discover the best of the lush tropical forest on the back of a specialized motorcycle with Hawaii Trials Adventures. What’s unique about these adventures is that the bikes are extremely lightweight, have short suspension travels and are actually designed to be ridden standing up, thus their lack of seating. Regarded as the ultimate downhill bikes, tours with Hawaii Trials are run in the Kahuku Motorcross park which features long technical climbs, sweeping downhill rides, natural terrain, rocky riverbeds and more. 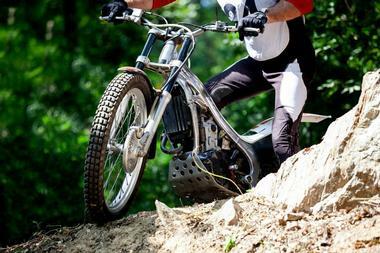 Test your skills and your mettle as you navigate what seems to be an endless variety of terrain. Found at the Old Sugar Mill in the North Shore’s Old Waialua Town, Island X Hawaii is a family owned and operated business that was established in 1991 by Bill and Reba Martin. Home to Waialua Coffee and the Chocolate Mill, Island X Hawaii supplies delicious coffee and chocolate to all visitors alongside locally made products like the best papaya seed salad dressing in Hawaii, Old Sugar Mill Natural Shave Ice and Waialua Soda Works. Visitors to Hawaii X Island can also enjoy a tour of the coffee mill, see coffee trees up close and learn all about the milling process. 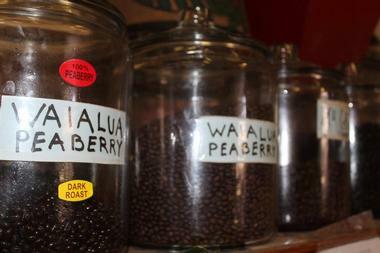 Make sure to grab a freshly brewed cup of Waialua Coffee and a bag of beans as well. 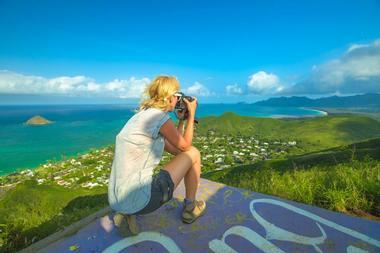 If you’re looking for a smart and absolutely breathtaking way to explore the best that Oahu has to offer, then you’re definitely going to want to participate in one of the Oahu Photography Tours. There are several different tours available such as the Circle Sunrise Island Tour, the North Shore Tour, the Golden Sunrise Photo Tour and the Beautiful Hawaii Tour. 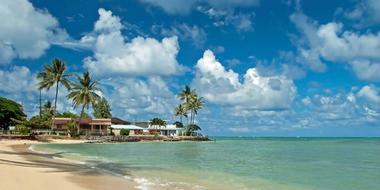 Each tour offers a memorable touring experience and hours of visits to the best locations along Oahu’s North Shore. What’s great about Oahu Photography Tours is that the company provides you with a tripod if you don’t have your own. Be sure to wear comfortable closed toed shows when you set off on the island photo tours and to bring a drink with you. Created by mountain bike enthusiasts for other riders, Mountain Bike Hawaii is all about exploring Hawaii through its beautiful jungle mountain bike trails and single tracks. Home to the famous Pipeline Beach, Sunset Beach, and the Waimea Bay, Oahu’s North Shore is home to several fantastic mountain bike trails that are frequented by the tour guides of Mountain Bike Hawaii. 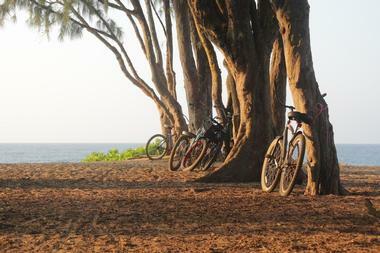 Some popular beach trails to ride include the Hau’ula Loop, West Kaunala Trail, the Ka’ena Point, Peacock Kealia Loop, Pupukea Paumalu Trails, Kahuku Moto Park and the North Shore Bike Park. Meanwhile, there are beautiful mountain trails at Ko’olau to explore as well such as the Maunawili Trail, the Ma’akua Ridge, Old Pali Road and the Ohana Trail. 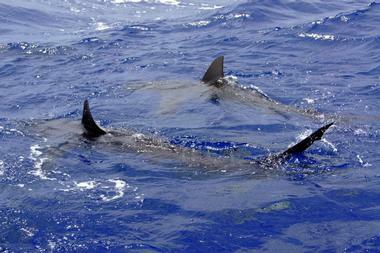 There is much to explore within the gorgeous oceans of the Oahu. If you’re eager to participate in the best tours possible, then you’re going to want to climb aboard one of the North Shore Catamaran Charters’ tours. Proud of their tours, which they describe to be “real Hawaiian style”, the North Shore Catamaran Charters’ main vessel is called the Ho’o Nanea. This 40-foot catamaran is sleek, fast and sets sail under the command of Captain Don, who is eager to satisfy the desires of tourists to experience an authentic Hawaiian getaway. 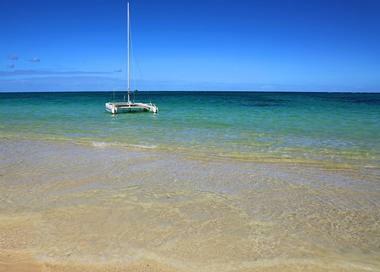 North Shore Catamaran Charters offers several cruises, snorkeling adventures and whale watching excursions. Some of the most popular include the 2-Hour Sunset Cruise, the Morning Whale Watch and the Sunset Whale Watch. Bringing amazing and wonder to visitors for hundreds of years, the North Shore of Oahu is full of lush jungles and stunning sandy beaches that are ripe for exploration. Spark a sense of adventure in yourself and in your companions when you leave your worries behind and simply explore with the North Shore Explorers. First launched in 2009 by the Hele Huli Adventure Rentals of the Turtle Bay Resort, guests are encouraged to create their own personal experience by creating tours that suit their own preferences. Meanwhile, rentals are also available with the North Shore Explorers such as bike, moped, and tennis court rentals. Other activities available include the Snorkel Ride Experience, the 12-Hole Disc Golf, Foot Golf and the VIP Beach Getaway. Get up close and personal with some of the most misunderstood inhabitants of the ocean with North Shore Shark Adventures. Operating safely since 2001, the North Shore Shark Adventures is the original and most popular shark adventure tour in the entire state. The perfect expedition for the brave and adventurous at heart, cage diving tours here guarantee shark sightings and allow tourists to see sharks in their natural habitat. Sharks aren’t the thing on the agenda, however, as divers will also get the chance to spot playful dolphins, magnificent Hawaiian green sea turtles and even the beautiful and serene humpback whales. 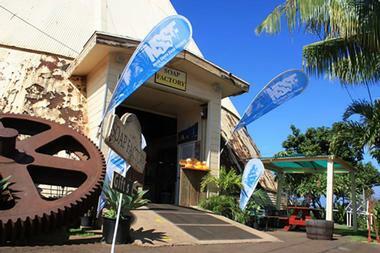 Home to the Hawaiian Bath and Body natural skincare, the North Shore Soap Factory is located in the historic Waialua Sugar Mill within the Bagasse bin. Visitors to the North Shore Soap Factory can enjoy a behind-the-scenes tour of the factory which isn’t just interesting and informative, but also delightfully scented. Known for creating beautiful soaps that are made from 100% natural ingredients and 200% Hawaiian know-how, the soap factory creates fantastic skin care products that aren’t just great for your skin, but also environmentally friendly. Make sure to stop by the store to pick up some of the soap factory’s handmade soaps, tropical lotions and gift sets. 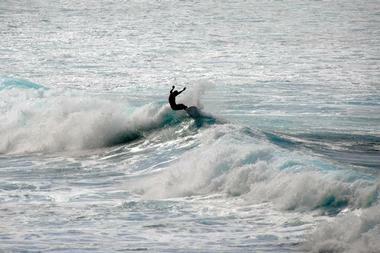 What location could possibly be better to learn how to surf than the magnificent waters of Oahu’s North Shore? At the North Shore Surf Girls Surf School, women of all ages can learn how to surf and stand up paddle board from professional female instructors. The Surf Girls use only the best in surf tech when it comes to boards and leashes, while Lycra rash guards are provided to all students. All lessons with the North Shore Surf Girls run from 1 to 2 hours depending on how much time you have on your hands, but of course, the surf girls recommend going with a 2-hour block to learn as much as you can. Oher special activities run by the North Shore Surf Girls include the Turtle Tour and Surf, the Sunset BBQ and Surf Lesson, as well as Tandem Surf Lessons. Admire the spectacular beauty of Hawaii from 14,000 feet in the air and at 120 miles per hour with the Oahu Parachute Center. The center’s staff are absolutely bananas about skydiving and are eager to take the leap with every visitor that passes their humble office. Whether you’re a first-time skydiver or a frequent jumper, the Oahu Parachute Center is the perfect place to enjoy the fastest skydive in Oahu with little to zero waiting time. Tandem Jumps with the center start with 60 heart pumping seconds of free fall followed by roughly 4 to 6 minutes of canopy flight. Adventurers can choose between a regular tandem jump or the sunset tandem jump. 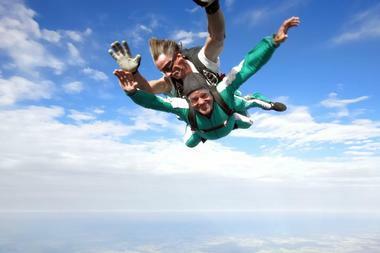 Meanwhile, there’s also a 10,000-foot tandem jump available. Usually, the best way to explore and enjoy a village is by experiencing the area the way locals do. With the Oahu Private Tours, this is exactly what you can look forward to: seeing Hawaii the way the islanders see it and doing as the locals do. Each tour offered by the Oahu Private Tours are hand crafted to match exactly what you and your travel companions want to see and need to experience. Skip the places that don’t interest you and fill your day with all the amazing sites that you want to explore and see with your own eyes. Not only are you sure to be making memories that you will carry with you for a lifetime, you’ll also get the inside scoop to all the top attractions at the North Shore. Set off on an exciting, exclusive and environmentally sustainable excursion around the North Shore with Paradise Helicopters. Paradise Helicopters has tours that depart from Hilo, Kona and Oahu, all of which are known for being spectacularly immersive and rich in awe-inspiring natural beauty. While on the helicopter, your professional guides will share interesting information about the islands, vistas and waters of Oahu, while treating you to sights and sounds that not many have the privilege to see. Enjoy flights on a hilo or kona helicopter with tours like the Doors-Off Lava and Rainforests Adventure, the Circle Island Experience, Experience Hawaii, Volcano by Air and Land, and the Volcano Kohala Landing. Kono's in the North Shore town of Haleiwa on the Hawaiian island of Oahu is known among locals for having the best breakfast on the island. Don’t let the unpretentious interior and paper plates deter you; once you try their tortillas filled with egg, potatoes, cheese, and whatever else you want, you will want to come back again and again. 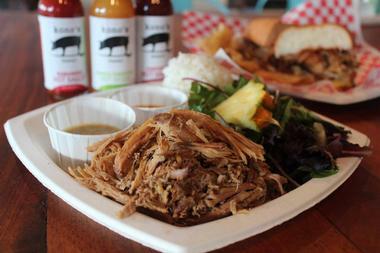 Their famous Kalua pork is cooked every day for 15 hours. Also try their triple crown sandwich with three kinds of pork or pork rice bowl with Kalua pork, rice, and guava barbecue sauce. They are also open for lunch, so stop by after a day of surfing. 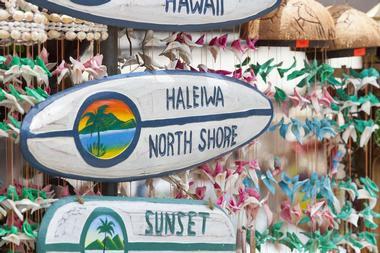 Say aloha to the great outdoors of the North Shore when you swing by the Outpost. 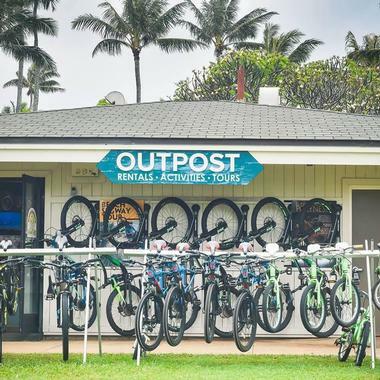 Located in the Turtle Bay Resort, the Outpost specializes in outdoor activities and tours while also offering bike and motorbike rentals for all those who want to explore the all that the surrounding jungle has to offer. Trails surrounding the outpost are spectacular and offer both easy and challenging routes depending on your skill level. Many trails are child-friendly, which means that you can take the whole family along with you as you all speed around the area. Take a self-guided tour or sign up for a guided tour with some the Outposts friendly, professional and knowledgeable staff. Founded and operated by a family of North Shore local residents, the Surf Bus will sweep every visitor off of their feet and whisk them off to a fantastic, life-changing tour of Oahu. As locals, the tour operators know all of the best spots to explore and visit on the island to give you as close to a native experience as possible. There are six different tours currently being offered by the Surf Bus including the North Shore Tour, the Shark Dive Tour, the Culture and Scenic Canoe Tour, and the Earth, Fire and Water Tour. In addition to their tours, the Surf Bus also offers several activities to enjoy as add-ons to your selected tour. 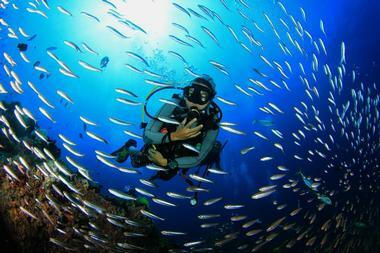 Some options to consider include snorkeling with turtles, a nature walk and waterfall swimming. Get a dose of Oahu’s wild side on an intimate journey planned and executed by Wild Side Specialty Tours. What people love about Wild Side Specialty Tours is their dedication to each visitor’s experience. To ensure that all participants get the best tour they possibly can, all tours are limited to a small groups of people. This way, everyone can learn about just how fragile the marine environment of Hawaii is and learn to appreciate and care for what Mother Nature has gifted the North Shore with. Wild Side Specialty Tours mainly offers to charters to their guests: The Best of the West, a 3.5-hour tour that includes the opportunity to swim with the dolphins, go whale watching and take a guided snorkeling tour, and the Deluxe Wildlife Charter, a 3-hour tour that features an onboard hydrophone to engage and draw whales and dolphins close to the boat. Explore the deep blue seas of Oahu without the fear of disrupting or damaging the reefs with Banzai Divers Hawaii. Specializing in ecologically responsible scuba and snorkel tours, Banzai Divers takes divers of all levels on explorations of the unknown to discover underwater mysteries and examine unique marine life up close and personal. The professional guided tours all practice non-invasive dive practices and are even suitable for children as young as 10 years old. All of Banzai Divers Hawaii’s tour guides are equally passionate about diving and are licensed teachers so that rookie divers can participate as well. From tunnels to arches, trenches and more, there’s a lot to behold in the glistening waters of the North Shore. What’s one of the best ways to see the North Shore’s most spectacular panoramas? By zipline of course! Home to the longest ziplines on Oahu, Climb Works in Keana Farms features up to half-mile long zip lines across the lush tropical greenery of the island. After taking an adrenaline pumping ride through the skies, visitors to Climb Works can then set off to explore the innerworkings of a working tropical farm in addition to learning about its rich history. Climb Works offers 3-hour guided tours which goes from one zip line to another and are perfect for adventure hungry parents traveling with their equally adventurous kiddos. 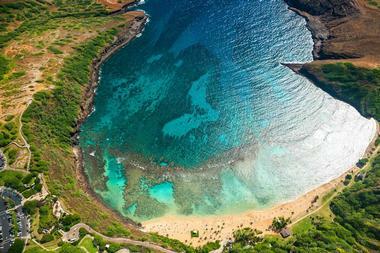 The beauty about Hawaii is that there are many ways to explore all that it has to offer. One of the favorite ways for adventure lovers and water sports enthusiasts is from within a kayak. At Shaka Kayaks Tours, you can experience an unforgettable tour of the secluded North Shore of Hawaii. Paddle through the Kawela Bay, waters that were once reserved for Hawaiian royalty, or the Alii, and marvel at the gorgeous marine life that is found in its waters. Shaka Kayaks has three amazing tours to choose from: the Shaka Kayaks Tour, which is their most popular one yet, the Shaka Sunsets Tour, and the Kayak Surfing Tours.